Top 10 Reasons Why Sponsoring our Event is a Brilliant Marketing Strategy for your Company. In today’s new economy, budgets have been cut in almost every area, including marketing dollars. In the world of advertising, you are being bombarded every day with messages of new and improved products and services. Traditional ads that shout buzz words about how different they are from their competition or why someone should buy something, have lost their impact and prove to be a waste of money. A more effective alternative is becoming an American Idogs show sponsor. Sponsoring our show could also improve, enhance, or change your corporate, brand, or product image. Here are the top 10 reasons why it’s a powerful way to promote your company with us. Companies in general have few opportunities to build trust and establish rapport with their customers and prospects. Getting involved with our show and being seen as dependable and supportive will accelerate the process. Attending an event is important but standing out in the crowd by being one of our sponsor will highlight you and your business with a captive audience. Events will have a certain mix of people that are in attendance. Our organization is responsible for creating the audience and will have a goal to bring together the right crowd that will benefit from our program. The majority of people who attend our shows will most likely know others with similar interests. Remember, not only will you be in front of them but may have a chance to be recommended to their connections as well. All events have their own marketing efforts to make sure the event is well attend and generally successful. When sponsors decide to be involved, they will automatically get the benefit of being promoted throughout the process. Our shows will have local media support while others may offer bigger campaigns. This could provide extended exposure and visibility in markets you have not tapped into yet. Logo placement in a variety of places such as flyers, direct mail, brochures, websites, ring space, bus, websites, email marketing campaigns, tickets, signage, etc. will add to increase brand awareness. Being recognized as one of our sponsor will communicate value and support with the audience at the event. Larger, more established corporations that get involved with our shows will be sending a message to the attendees that they are genuinely interested in providing support. Companies that show generosity for a cause will spark more human interest and appeal to the audience. Whether your company has been around for years or just starting, bringing samples to a show is a great way to “test market” before investing in a major marketing campaign. Consider giving trial offers to the attendees in exchange for honest feedback. This will provide useful information and allow your company to adjust accordingly. Acquiring a list of attendees may prove to be the most valuable asset available to a sponsor. If we are unable to provide the contact list for privacy reasons, it is perfectly acceptable for us to send out your marketing message on your behalf. With today’s advancements in social media, it’s important to know what we have an online presence as well. Association with High Profile Business Events – Companies that desire to be coined “Industry Leaders” welcome the benefits of being associated with important business events and programs. Entertainment shows are among the top places to gain name recognition with your targeted market and future potential customers or other business decision‐makers. Could your dog be one of our National team members? Do you and your dog have what it takes to become a member of the biggest dog entertainment show in America? You may have seen American Idogs perform at the Marlin’s games, now you can become a National team member and be part of a National tour. If selected, you will receive free training as an Elite Team member. Who can apply? 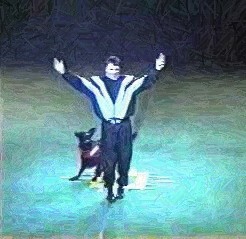 Owners and dogs with exceptional skills in canine musical freestyle, agility, fly ball, Frisbee™, obedience, or tricks. Dogs must be less than 8 years old. Only amateurs without casting or company contracts are eligible to apply. Bring all your furry friends. Contest, prizes, and music all day. Info and registration for audition, phone 954-829-3274. Audition Day is Saturday, October 9 from 11 am to 1pm at Sunview Park 1500 SW 42 Avenue, Fort Lauderdale (Corner of State Road 7 and Davie Blvd.) 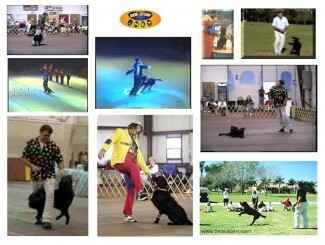 www.americanidogs.com Information or to sign up, call 954-829-3274, fax 954-322-8764, or e-mail info@americanidogs.com.